We talk about response bias in nearly every survey or interview that is conducted, but perhaps we fail to give due attention to the role that fear plays in this process or how to address it. We add a little text intro to a survey in a sweeping attempt to put the interviewees’ minds at ease and move on. Often, the survey is being conducted in the interest of getting a representative understanding of a population, so we accept the bias and proceed. With Ebola Virus Disease (EVD), fear has been a particular and piercing challenge in Liberia. I’m certain most of you have read about community fears in regards to the way EVD spreads, the cremation of bodies at Ebola Treatment Units (ETUs) or the infectiousness of people discharged from ETUs. In my meager work, I have experienced the difficulty of fear most directly through contact tracing, one of the central tenets in stopping the spread of EVD. In these efforts, response bias is more challenging to accept. As people suspected of having EVD are sent to ETUs, they are forced to confront a world of uncertainty and unfamiliarity. They are told that they may have Ebola, often perceived as a prelude to death. They are surrounded by strangers scrambling around in white, rustling suits that not only mask mucous membranes but most ability to convey emotion. Families often arrive together or within a few days of one another, thus there are fears about the shape of the family structure afterwards. And in this time of fear and uncertainty, as they are getting in the ambulance or while being triaged at the ETU, people are asked to recount all those with whom they have come in contact. Every handshake, every hug. Every shared cup or crowded transport squeezed into. Can you remember these details for yourself over the past week? I certainly can’t. The information received at this point has acted as the cornerstone for contact tracing, with most additional tracing done through tertiary sources. This approach has proved problematic in securing a complete and accurate recounting of contacts with many false leads, omitted contacts and wasted time for already overwhelmed contact tracing teams. As we saw relationships between patients and our psychosocial teams grow while passing time together in the ETU, we began reframing the way contact tracing was undertaken from a one-time engagement done at admission to an iterative process throughout a patient’s stay in the ETU. 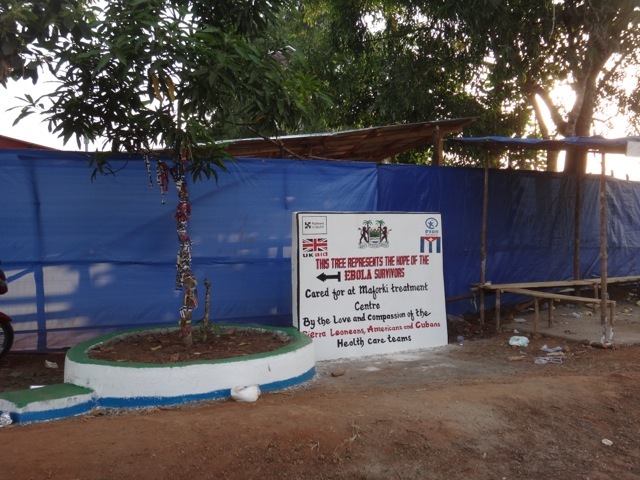 On average, EVD positive patients who eventually recover spend 16 days at our ETU. We found that patients felt a lot more comfortable sharing sensitive information once rapport had been established with our psychosocial team, understandably. This is by no means a shocking revelation, but in the heat of the response the depth of these relationships was not immediately obvious. This dynamic didn’t surface until we were sitting around the clinical tent trying to piece together relationships in a cluster, and a psychosocial staff strolled through and nonchalantly said, “Oh, Mamie? She was the cook at Jackson’s funeral.” Once we engaged the psychosocial team in identifying contacts and cluster relationships, we were able to construct much more accurate contact and family trees through this routine engagement. We have been channeling this to the MOH and county health teams leading the tracing efforts in the hope that this minimizes time and resources lost following inaccurate leads, fills initially omitted contact gaps and helps to reduce the spread of new cases. Initial responses have been incredibly positive and discussions around the possibility of engaging psychosocial teams at all ETUs in contact tracing efforts have commenced. I raise this not as pat on our back, but in the interest of being more mindful of the fears of the people we serve and acknowledging that as we address those fears in a sincere and meaningful way, the quality of the work may also benefit, helping to achieve the desired outcomes in communities. In a field where urgency is endemic, this frame adds cause for contemplation, at least for me.